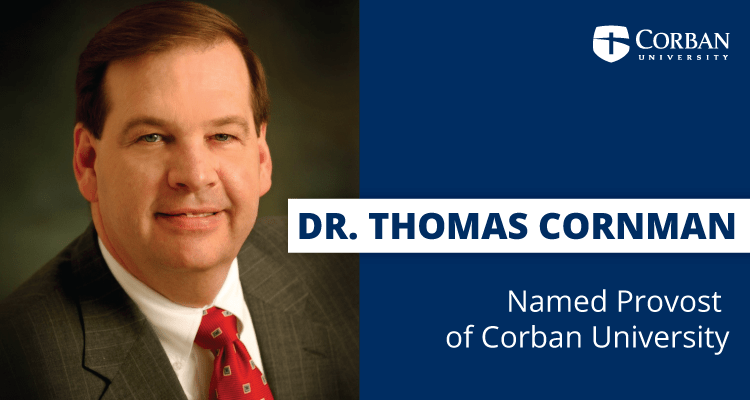 After a careful search, Corban University has selected a candidate for the position of provost: Dr. Thomas Cornman has accepted this position and will begin, tentatively, July 1, 2019. Dr. Cornman received his undergraduate degree in Bible Ministries at Cairn University (Langhorne, PA); his M.Div. in Church History at Talbot School of Theology (La Mirada, CA); his M.A. in Religion at Temple University (Philadelphia); and his Ph.D. in U.S. History to 1877 from the University of Illinois, Chicago. He has taught (primarily history) at St. Francis College (Joliet, IL); University of Illinois, Chicago; Aurora University (Aurora, IL); Roosevelt University (Chicago); Trinity International University (Deerfield, IL); and Moody Distance Learning Center (Chicago). Dr. Cornman has also served in leadership roles in institutions similar in mission to Corban University. He served as Vice President and Dean of the Undergraduate School at Moody Bible Institute (Chicago, 2001–2009), Vice President for Academics and Chief Academic Officer at Cedarville University (Cedarville, OH, 2009–2015), and Senior Vice President for Academic Administration and Dean of Trinity College and Graduate School at Trinity International University (Deerfield, IL, 2015–present). Dr. Cornman is married to Sue Cornman, and their two grown children are living in Southern California. Please join Dr. Nord and the Cabinet in praying for Tom and Sue during their move to Salem and transition into this important executive leadership position at Corban.